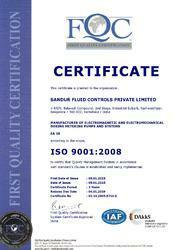 The business activities of Sandur Fluid Controls Private Limited were commenced in the year 1986 to serve its clients in the industry. With its office based at Bengaluru, Karnataka (India), we are operating our entire business activities as a Private Limited Company based venture. As a leading manufacturer, exporter and supplier of our entire product range, we offer Dosing Pump, Metering pump, Defluoridation Systems and many more to our customers. Our product range is completely based on customer satisfaction with a commitment to the further development of our working practices. Our strong sales network helps us to cater for our nationwide spread clients in an effective manner. The cutting edge techniques of production installed in our manufacturing unit makes possible for us to meet the bulk and urgent demands within the stipulated time without any compromise on quality. They are designed accurately and precisely as per the specific demands of our valuable clients. Offered by us at industry leading prices, these products are highly appreciated among our customers. Being the (Team Leader- Marketing) of our organization, Mr. K S Dinesh Kumar keeps his complete vigilance in all the business activities of our organization. He is an ideal to our employees because of his innovative ideas. He maintains a comfortable and enjoyable environment in the company campus for our staff members. He is always ready to face new challenges and also motivate employees of the company for the same. With the help of our efficient team members, we ensure our customers that they never have to worry about the quality of our product range and performance of our products. They accomplish the assigned tasks with their utmost dedication towards their work. They properly listen and understand the requirement of our clients and show their awareness in the whole manufacturing process. We are dedicated towards customer support and our staff endures their best to provide best customer support with their endurance. To offer superior product quality to our valuable clients, we utilize advance technology and qualitative raw material while manufacturing the products. Our offered products are quality assured as they are rigorously tested on different quality parameters. They have intricate carving, elegant look and flawless finishing. All our products are encased in premium packaging material and we ensure timely shipment of consignments at our clients’ destination. We are exporting our products in SOUTH AFRICA, USA, EUROPE and ASIA with 40 % exporting. We have recruited a team of self efficient members, who are well skilled in their respective domain. On regular basis we conduct training sessions for our team members so that they may remain aware of the latest changes taking place in corporate world. They are completely devoted towards their assigned roles and easily go beyond their working comfort to maintain the company standards and ethics in the industry. We have built a highly impressive manufacturing unit, administrative office and other required departments for our organization to execute various activities related to our business. This well equipped unit enables us in manufacturing the finest quality products. Our infrastructure is operated in compliances with the set rules and regulations of the industry.